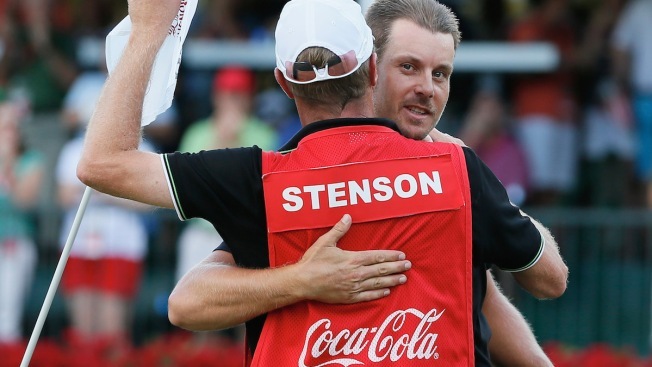 In this file photo, Henrik Stenson of Sweden celebrates on the 18th green with his caddie Gareth Lord after winning the TOUR Championship by Coca-Cola and the FedExCup Playoffs at East Lake Golf Club on September 22, 2013 in Atlanta, Georgia. A group of PGA Tour caddies sued the PGA Tour in federal court Tuesday for making them wear bibs that have the logo of the tournament sponsors without sharing in what it estimates as $50 million in endorsement revenue. A group of PGA Tour caddies sued the PGA Tour in federal court Tuesday for making them wear bibs that have the logo of the tournament sponsors without sharing in what it estimates as $50 million in endorsement revenue. The class-action suit on behalf of 81 caddies was filed in San Francisco, where former UCLA basketball star Ed O'Bannon successfully sued the NCAA for keeping college players from selling their marketing rights. "This lawsuit is intended to protect the rights of caddies who are required to endorse tour sponsors with zero compensation from the PGA Tour," said Gene Egdorf, the caddies' Houston-based lawyer. "Any working professional deserves to be paid based on the income they generate, but that's not happening on the PGA Tour." At issue was whether the tour had a right to force caddies to wear bibs and "retain for itself the tens of millions of dollars in advertising generated by those bibs." The bibs a caddie wears have the players' name on the back, and the tournament logo on the front. The lawsuit also claims the tour has denied caddies access to basic health care and pensions plan.